In recent years is the Oi Vert Jam skateboarding competition generally opened the annual calendar of the WCS (World Cup Skateboarding). But not this year: the WCS already organized 4 contests in 2012: the Vans Combi Pool Classic, the Newcastle Australian Bowl contest, and the two Bowl-A-Rama, the one in New Zealand and in Bondi. The CBSK (Brazilian Confederation of Skate) released today information about the Oi Vert Jam in Rio de Janeiro in 2012 and the official program of the competition which will be valid as the first stage of the WCS 2012 World Tour, pointing to the Annual Ranking World Cup Skateboarding. The event will be broadcast live by Rede Globo on Sunday morning on March 4. The Oi Vert Jam is a Vert contest that traditionally take place in Rio de Janeiro. 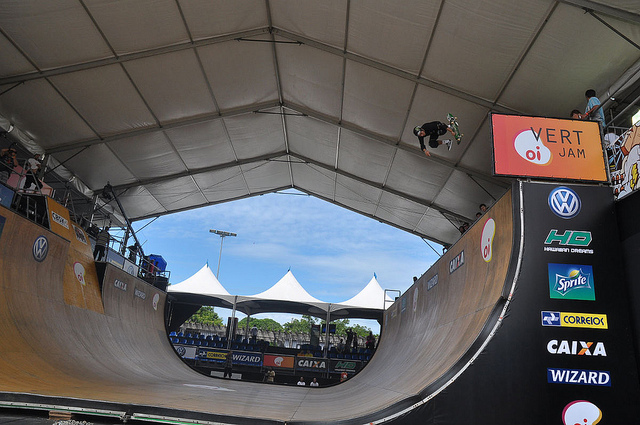 Since 2002, Vert Jam is part of the major skating competitions held in Brazil. Marcelo Bastos, Champion last year, is right in the end. Ten (10) pre-qualified skaters go straight into the semi final. PRACTICE: Practice free - open to all skaters registered. TRAINING FOR BATTERY: Only skaters from its battery. Will always be the same batteries with competitors. HEATING: Each battery will have 20 minutes of warm up before competing. ROUND: 30 skaters - three batteries, three rounds, each round wall 15, it is best lap, 10 skaters advance to the semi final for a total of 20 skaters. SEMI FINAL: 20 skaters, 2 batteries of 10 skaters, 3 laps, 15 walls every turn, it's better back nine skaters advance to the Final and join Marcelo Bastos. Format of 15 laps on the walls: each round will consist of up to 15 walls. If the skater falls before completing 13 walls, your back is closed. Skaters descend in order for the third round and round in the semi final. Skaters descend in order for the four laps in the Final. Draw: It's better paying back a note of all judges. Tie persists, the second best lap worth note of all judges. Still a tie: the third best lap worth note of all judges. Fourth best lap worth note of all judges. In the event of a tie after the criterion of using all the notes of the fourth round head judge chooses the tiebreaker. Marcelo Bastos - Champion last year and ranking CBSK - right in the Final! The total prize is $ 20,000, divided among 00 top 10 skaters. The Hi Vert Jam is a realization of MaxSports and has the technical organization of CBSK (Brazilian Confederation of Skateboarding and WCS (World Cup Skateboarding). Good luck to the participants of skateboarders Hi Vert Jam in 2012 and is a tip for those who want to go to Rio de Janeiro monitor the competition.